Captain Marta Ramos, the most notorious pirate in the Duchy of Denver, has her hands full between fascinating murder mysteries, the delectable and devious Delilah Nimowitz, Colonel Geoffrey Douglas (the Duke of Denver's new head of security), a spot of airship engineering and her usual activities: piracy, banditry and burglary. Not to mention the horror of high society tea parties. In contrast, Simms, her second in command, longs only for a quiet life, filled with tasty sausages and fewer explosions. Or does he? Join Captain Ramos, Simms and their crew as they negotiate the perils of air, land and drawing room in a series of fast-paced adventures in a North America that never was. 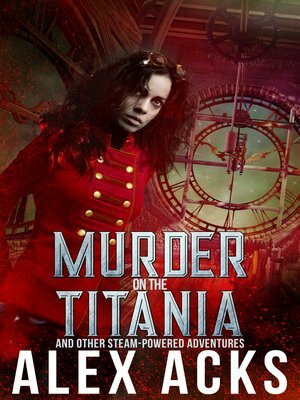 Murder on the Titania: Colonel Geoffrey Douglas, the Duke of Denver's new head of security, is drawn into a high society murder mystery on the Airship Titania. None of the passengers are quite what they seem, including the mysterious young woman who always turns up where she is least expected. A simple burglary goes horribly awry when Captain Ramos and Simms stumble across a dead body, a small dog and the deceased's heirs, the noisome Morris and the rather too interesting Delilah. The Ugly Tin Orrery: Captain Ramos and her crew embark on what appears to be a perfectly ordinary train robbery, only to be drawn into the Duke of Denver's political machinations via a strange metal artifact. Throw in a spot of jail breaking and an encounter with the lovely Delilah, and it's all in a day's work for Captain Ramos and Simms.